I invite anyone who has a desire to learn about my attempt at sustainable living can visit here for a week and help with the chores ($10/day donation to help with food). Please email me with your information as this needs to be planned. 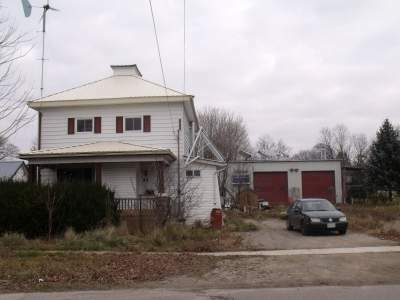 This whole venture began about 2004-2005 when I found a very ideal property in Port Burwell and started my attempt at a sustainable lifestyle but first I had to do a lot of research to weed out the politically supported but impractical from the practical although maybe not popular. The goals I want to achieve are to be able to produce my own electricity, heat and food and reduce my emissions as well be reliant on the local community for shared labour, food and good times. My transitional solution is what I call fossil fuel subsidized sustainable living and will be good for the next 5 to 10 years. If there is any conclusion I have it is that sustainable and renewable energy sources cannot support our current lifestyle. What people think is a small amount of energy is actually quite the opposite. Think of it this way. A liter of gasoline will drive a car about 25 kilometers -now push your car that distance and see what one liter of gasiline is actually worth.There is only one solution -Cut your energy consumption by 75% and live locally! Of all the difficulties there is none more frustrating than dealing with the Municipality of Bayham whose councilors have little knowledge and do not do any research into our imminent future without fossil fuels.